This route leads from the Senate House Car Park to Oak House via the Lecture Theatre Block and Library. This route is approx. 250 metres. You are on Cross Senate House Car Park to Senate House main entrance. Skip to the next section. From the car park cross the zebra crossing towards Senate House and Security Reception. 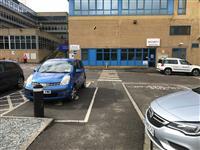 The car park has a tarmac surface that is uneven in places. 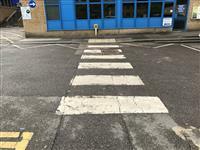 At the far end of the zebra crossing there is a dropped kerb with tactile paving. Turn left and follow the path around the building to the main entrance for approx. 11 metres. The path has a tarmac surface and is uneven in places. There is an easy slope leading to the main entrance. Please proceed through Senate House, passing through the automatic double doors which open towards you, towards the lift. Take the lift to the second floor, the lift is small and has a mirror. Turn right as you exit the lift towards the exit door. 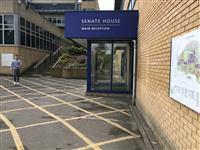 Please see the Senate House access guide for more information for access around the building. 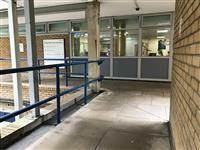 You are on Exit Senate House and follow the path around to the right to the front of the Philip Marchant Building. Skip to the next section. 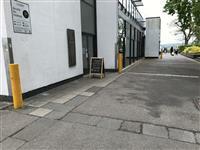 Continue straight ahead then turn left and follow the path around to the front of the Philip Marchant Building. 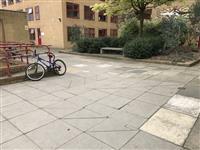 The surface of the path is paving slabs which is uneven in places. 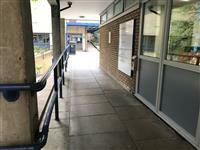 At the front of the building the accommodation services of the Philip Marchant Building can be accessed. 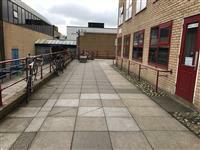 To continue to the Lecture Theatre Block please proceed diagonally to the right towards the ramp adjacent to the Philip Marchant building as shown in photograph 3. The distance from the exit from Senate House to the ramp is 24 meters. For more information about the Philip Marchant Building please click here (opens in new tab). You are on Take the ramp to the Lecture Block Senate House side entrance. Skip to the next section. 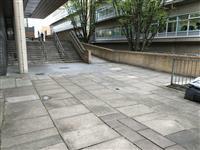 Take the ramp up to the Lecture Theatre Block entrance. The entrance is 22 meters from the bottom of the ramp. Then proceed through the Lecture Theatre Block main foyer and turn right and exit at the Library side entrance. 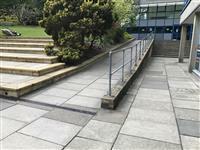 Please see the Lecture Theatre Block access guide for more information on access details. You are on Lecture Theatre Block to the Learning Centre 24 hour entrance. Skip to the next section. Exit the Lecture Theatre Block and proceed to the steep ramp leading up to the Learning Centre. 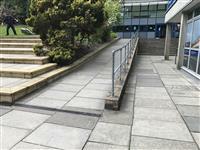 The path is a mixture of slabs and block paving and is uneven in places. The distance from the Lecture Theatre Block to the Learning Centre 24 hour entrance is approx. 34 meters. Enter the Learning Centre and proceed straight ahead through the ground floor foyer to the main entrance. Please see the separate guide for more information for access details. 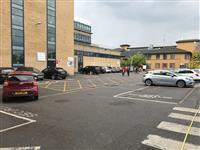 You are on Exit the Learning Centre main entrance and turn left towards Surrey Court. Skip to the next section. 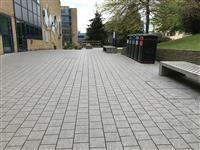 The path has a block paving and tarmac surface which has an easy to moderate slope. 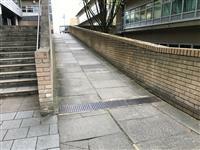 Where the slope levels out bear right past the steps and follow the path towards Surrey Court. This path is block paving becoming paving slabs. The path is uneven in places. The distance is 56 meters. You are on Follow the path around the side of Surrey Court - Wey towards Oak House and Hall Complex. Skip to the next section. 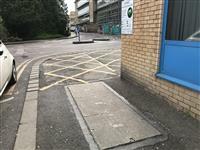 The path to the side of Surrey Court Wey is paving slabs and uneven in places. 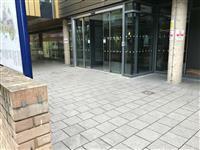 Once past Surrey Court - Wey continue diagonally towards Oak House and Hall Complex where the surface changes to block paving. The distance is 26 meters. You are on Follow the path around to the Hillside Restaurant entrance. Skip to the next section. 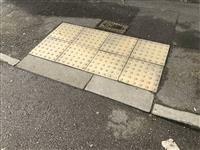 The path has a block paving surface which is uneven in places particular around drains. Just before the surface changes to tarmac there is an easy slope up and a drainage gully as shown in photograph 1. Follow the tarmac road round to the left and the Hillside Restaurant entrance is on your left. 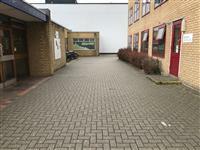 There is a block paving surface just in front of the entrance. The distance is 29 meters. Please see the Oak House access guide for more information regarding access details.